The word “Montana” is nearly synonymous in outdoor circles with adventure. The state draws skiers, hikers, backpackers, anglers, and travelers from around the globe, eager to explore the region’s tall mountains and vast plains. 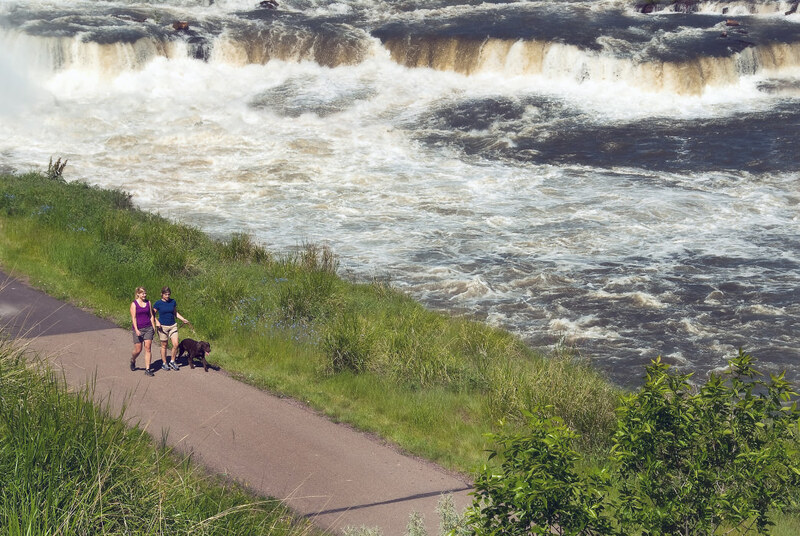 But in Big Sky Country, occasionally adventure and civilization combine—in the north-central city of Great Falls, Montana’s Basecamp for Art & Adventure, the River’s Edge Trail offers more than 60 miles of paved and singletrack trails alongside the mighty Missouri River. Readily accessible for hiking, walking, running, skating, cycling, snowshoeing and mountain biking, the well-used trail is a local favorite. Over the years trail connections, including bridges, tunnels, and underpasses have been added. The days of grizzly attacks are long gone. Instead, the banks of the Missouri River are now a playground for those looking to enjoy the outdoors. The trail system itself is relatively new: In 1989, the Great Falls City-County Planning Board staff developed the town’s first conceptual plan for a riverside recreational trail. That same year a volunteer group began working with the city to develop the first segments of the trail. As construction continued, two years later in 1991 the Great Falls Tribune held a naming contest for the trail. Hundreds of names were submitted, but “River’s Edge Trail” won out. Over the years trail connections, including bridges, tunnels and underpasses have been added, increasing the total distance to slightly more than 60 miles and it continues to grow. 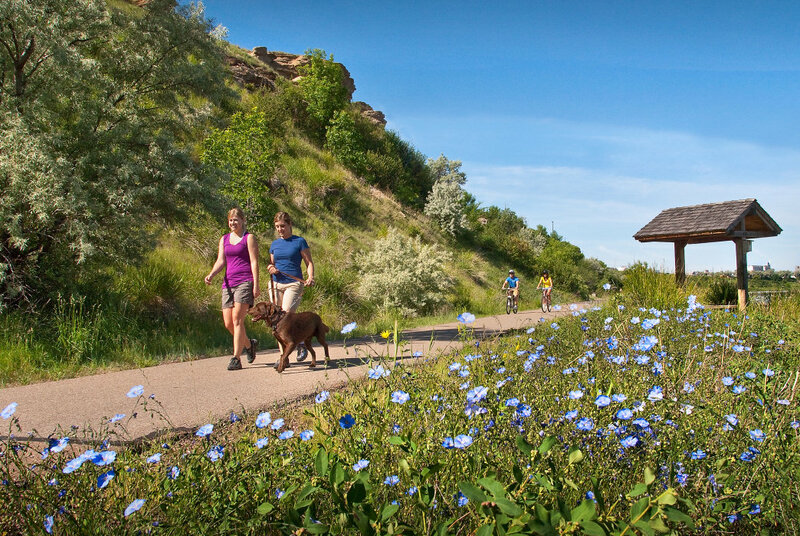 What had started as a simple “Rails-to-Trails” project has since grown far beyond the initial planning, and now the impressive system offers area residents and visitors alike an easy way to stay fit, explore the city, and enjoy both river and prairie views. Additional plans are ongoing for expansion of the trail, which is under the care of the River’s Edge Trail Foundation, charged to promote development, ensure maintenance, and encourage the trail’s use. Taking a stroll on the River’s Edge Trail is the best way to view the five waterfalls on the Missouri River. There is no easier way to see the five waterfalls of the Missouri River than by taking a stroll on the River’s Edge Trail. Throughout its length, the trail moves past all five of the falls and five hydroelectric dams, offering stops at numerous parks, Great Falls’ downtown, and various dining options. Along the trail, you’ll come across 19 trailheads, two two disc golf courses, 6 tunnels, 15 Bridges, 23 parking locations for quick access, and 13 underpasses. You can see the historic Tenth Street Bridge, which was completed in 1920 and is now listed on the National Register of Historic Places. Visible north of the trail loop at the reflecting pond is the Boston and Montana Barn, a large, beautiful white structure that’s the only surviving building related to the smelting and refining operations still in its original location. 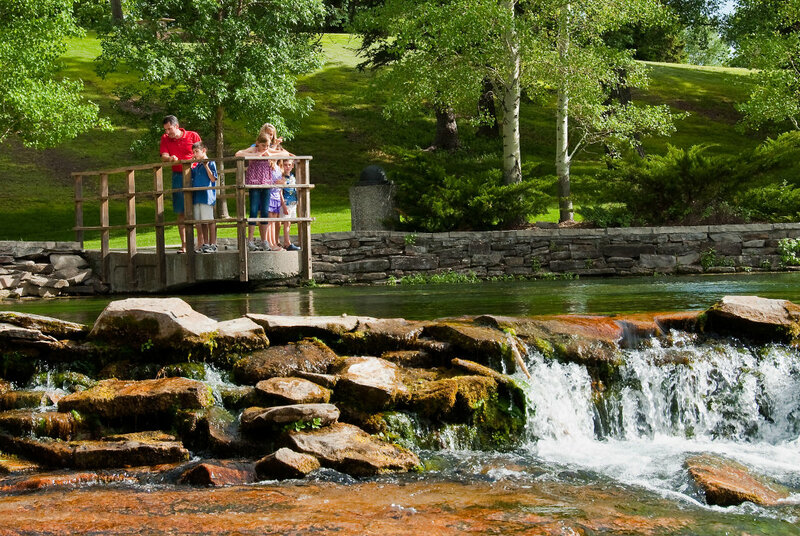 The most visited state park in Montana, Giant Springs draws more than 500,000 visitors a year. The many features of the trail include 24 public art pieces, free use of a telescope at the Warden Park Gazebo, singletrack mountain bike trails along the canyon walls leading to several of the dams, and access to the Lewis and Clark Interpretive Center. The historic center offers a variety of exhibits and ranger programs celebrating the indomitable spirit of the 1804-06 Lewis and Clark Expedition, and is a must-see stop for visitors yearning to understand the nuanced history of the northern plains. Visitors can also stop along the trail to explore Giant Springs State Park, taking in one of the world’s largest freshwater springs as well as the Roe River, recognized by The Guinness Book of World Records as the world’s shortest river. The most visited state park in Montana, Giant Springs draws more than 300,000 visitors a year and offers 4,500 acres for exploration, including more than 20 miles of singletrack trail to hike and bike. Miles of paved trails offer a relaxed option for those so inclined, and visitors often spend their time fishing and trekking the vast wildlands. Dogs are welcome but must be kept on-leash. A dog park is adjacent to the trail, offering an off-leash area for canine interaction, while owners can enjoy the shade of a pavilion and relax on neighboring benches. The South Shore singletrack mountain bike trail runs along the reservoirs from Crooked Falls to the Box Elder Creek canyon, and houses trails fit to challenge a variety of skill levels. Close to the river the more technical rides, known to locals as the “Mayhem” trails, offer a scenic view with challenging riding. In June, the free Luminaria Walk is held on the trail, with one thousand hand-decorated bags filled with tea lights illuminating the trail at night from Gibson Park to West Bank Park. While much of the path is paved, don’t forget about the 22 miles of singletrack trails along the reservoirs east of town. It’s become one of the top mountain biking destinations in the region. 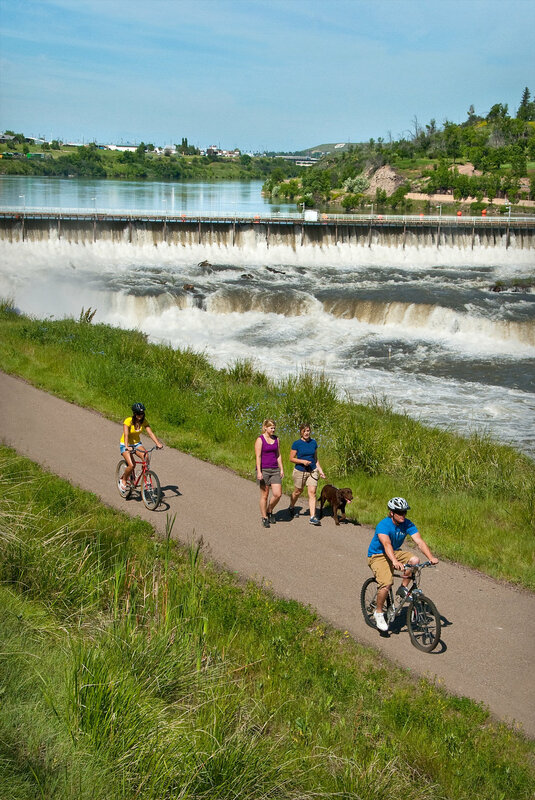 Trail maps showcasing parking, attractions and points of interest are available at the Great Falls Montana’s Tourism Basecamp, local bike stores, the Parks & Recreation Department, and from the River’s Edge Trail. Originally written by RootsRated Media for Great Falls.